Our speaker, Doug Ellison, has a passion for spaceflight and his talk was entitled "Cosmic Casualty: Farce and Fortuity in the Exploration of Space" and he drew from his encyclopedic knowledge of the subject to give us a few examples of how things do not always go to plan in space exploration. Back in 1977 a pair of spacecraft called Cassini-Huygens was launched on a mission to Saturn. Cassini was an orbiter and Huygens a smaller probe that would detach and land on Titan, which was one of Saturn´s moons. Long after the launch engineers discovered to their dismay that there was a design flaw in Cassini. With the planned trajectory, as Huygens descended through Titan´s atmosphere Cassini would not be able to relay data from the probe back to Earth. With no way of altering either the software or hardware on Cassini the flightpath of Cassini was changed to reduce the relative descent velocity of Huygens and make sure the valuable data was not lost to interplanetary space. This was not the only problem to beset the mission. 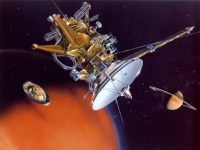 Somehow the computer programmers at ESA had forgotten to include instructions for Cassini to turn on one of its radio channels so that Huygens could transmit image data and wind speed measurements back to Earth. This meant that only 350 pictures were received instead of the 700 planned and none of the wind speed data was transmitted. However, a global array of radio telescope known as the VLBI (Very Long Baseline Interferometry) did manage to capture the very weak signal from Huygens itself; although the measurements were not as accurate as those that would have been obtained from Cassini. Sometimes other factors can seriously affect a mission as NASA found with the Galileo spacecraft´s orbital observations of Jupiter. It needed to use the gravity wells of Venus and Earth to gain enough velocity to reach Jupiter. On its first Earth flyby the engineers suddenly discovered that its high gain antenna would not deploy properly. Galileo had a low gain antenna but this only had a data transmission rate of 8-16 bits per second compared with the 134 kilobits per second transfer rate of the main antenna. Despite all attempts the NASA engineers were unable to free the stuck antenna, which resembled a partially opened umbrella with wire mesh instead of a cloth covering. So, just as with the fateful Apollo 13 mission, the engineers improvised and managed to get the low-gain antenna up to 160 bits per second salvaging some of the science goals. One of the possible reasons for the antenna failing to open is that before it launched it had travelled 7,635 miles on US highways on the back of a truck. Due to the Challenger Space Shuttle disaster in January 1986 Galileo´s launch was delayed until October 1989. So it ended up being ferried twice between the Jet Propulsion Laboratory in California and Kennedy Space Center in Florida. This as well as time in storage may well have resulted in the lubricants in the antenna struts effectively disappearing.